Any two numbers greater than 100. Preferably, the two numbers are close to 100. 103 x 105 = ? Find the difference of the two numbers with 100. 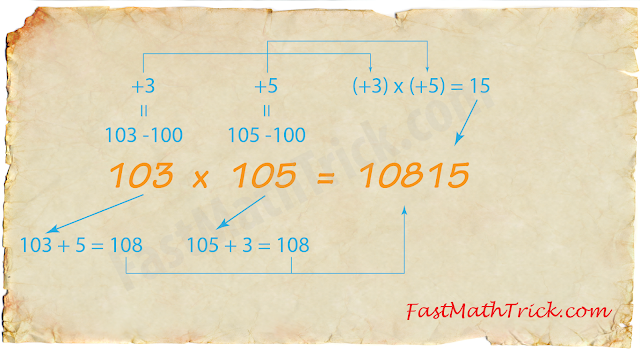 For example, 103 is 3 greater than 100, hence the difference is +3. 105 is 5 greater than 100, hence the difference is +5. Add the numbers we obtained in step 1 to the multiplicand and multiplier in such a way that, the difference of the multiplier added to the multiplicand or vice versa. The answer obtained will be the last 3 digits of the product. (See image below). Find the product of the two numbers that we obtained in step a. In this case, they are +3 and +5. The product of this two numbers will be the first two digits. Combine the answer that we got in step 2 and step 3. 103 x 105 = 10815. 106 x 109 = ? 103 x 102 = ? Take note that, if the product of the complement is a single digit number, we make it double digit by adding a 0 in front of the number. For example, 6 become 06.